Hi everyone! Its Katie again and its time to Spotlight another great stamp set for you. Today, I'm sharing the stamp set called Imperial Monogram which retails for $14.99. As you might have seen, monogram designs are everywhere and you know what, they will never go out of style. This set includes a Classic font with two different sizes. The larger of the letters are generally meant to be used to represent a person's last name and the smaller letters are used to represent a first and middle name. There are also two very classic circle filigree borders as well as accompanying stamps to go with the set. Basically, whenever I need a "go to" idea or gift for someone, I absolutely LOVE to make a set of monogram notecards and either wrap them up in a pretty bow or house them in some sort of pretty packaging. For my project today, I am planning on sending these away to a lovely, lovely lady that helped my Mom and I tremendously while we were in Florida taking care of my Grandmother's apartment. We really couldn't have accomplished what we did without her help. I took a picture of the most important pieces of what I needed to assemble my notecards. I decided to start with a square notecard and in this case they measure 4 1/4" x 4 1/4". I also decided that I wanted something very simple, elegant, and classic at the same time. I have no idea what her favorite colors are so I stuck with white - I just don't think you can ever go wrong with white. For my accent color, I decided on a nice pale aqua color. As you can see, I embossed a plain white layer with the Swiss Dots embossing folder. This layer measures 4"x4". I also cut out my center pieces with the Label One Nestabilities (the 3rd largest shape). These pieces are the ones that I am going to stamp on. In this case, I didn't know what the middle initial is of my gift recipient so I decided to just use the letter of her first name. I also decided to go with one of the accent pieces rather than the circle border. The stamp I used works perfectly with this die cut. It was also incredibly easy to line up due to the matching shapes of the stamp and the edging of the label. I then decided to use black ink for the initial so it would really stand out and make a statement. And remember, we are dealing with clear stamps here so the alignment is SUPER EASY because you can see where you are stamping. I have another note here as well. Even though I'm using a relatively tiny stamp and only one letter, I personally like to use a larger clear block so I can clearly see the entire surface of what I am stamping on. Sometimes if the block "fits" the stamp, I feel like the edges of my block become a visual issue for creating that perfect alignment. Just remember to keep your pressure even since your surface is larger and its easier to put pressure on the outer edges of the block when you are stamping. Because the ribbon is slightly thicker (lots of great texture), I decided to use pop dots to adhere my layer to my card base. I also feel that this gives the notecard extra interest considering that I'm dealing with a lot of white. Lifting layers is a great design tip and I love my pop dots! I did this as well with the monogram label too. Its both functionally better as well as aesthetically pleasing. So of course, the next step is to create a lovely box for them. I decided to make just five cards and due to the thickness of these notecards, my box was the right size. If you kept your notecards flatter, then you would be able to fit many more in the box. I also decided to leave envelopes out of the box and my thought was that my friend would just use them as needed at school (she is in charge of a pre-school). Box Bottom: 8 5/8" x 8 5/8" and score in 2" on all four sides. After you have creased all your folds, snip your corners. Box Top: 6" x 6" and score in 5/8" on all four sides. Fold up just like the Box Bottom. That is essentially it to my little gift. Just a quicky note that I did cut out an opening on my box lid with a larger Labels One die and then glued some transparency on the inside. I love this little window. So, seriously, if you don't have a monogram set in your collection you really should have one. This set is super easy to use and elegant in style and function. You can never go wrong with a set of monogram cards as a little gift or thank you. Plus, they are super handy and fun to have on hand for yourself. Thanks for coming to visit and how exciting... tomorrow or today is the day that all those fabulous new releases can hop right into your shopping cart... just don't forget to add this little beauty too! 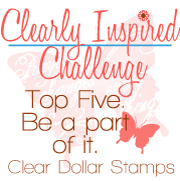 This is Katie signing off for Clearly iStamp. Go have a happy day! Day four of Sneak Peeks at Clear Dollar Stamps! More critters by Laurie! Will we ever get tired of them......NOOOOOOOO! This set is called Woodland Critters.....I just love the sayings in this set! This set was another set requested by our customers! How many times would a pickett fence have been nice to have? Another request by our customers! I started with glossy white cardstock. I stamped in my Versamark pad, then stamped in my green ink pad, then on to the glossy cardstock (be very careful, your stamp will want to slide!). Sprinkled with clear embossing powder and heat embossed. I then took a different color of green and formed more sections of my trees....I used three greens in all. My card recipe is listed below. Once you have all of your tree branches stamped and embossed, I took a craft sponge, dipped it in my blue ink pad and dabbed my blue sky on. The blue won't cling to anywhere you have embossed! I then made my Flower Soft flowers (tutorial here), and took my Flower Soft wires and twirled them around a thin piercing tool to create my leaves/vines for the flowers. I thought the little hinges were just perfect to give a gate effect! I held the hinges on with our micro brads! This card also uses the Woodland Critters also set for April release! Tomorrows the big day! All of these stamps you have seen the last four days will be ready to make a trip to your home! Wait until you see what our design team has come up with for this stamp set, Sunflower Songs! Candy really outdid herself with this sample set! Oh my goodness! Wow! Wow! Wow! Great job Candy! Here is the stamp of the month for April that is FREE with a $50 order! We have named this set Silhouette Wishes. So cute! Candy, was really on a roll this month wasn't she? She designed this template purse, and, I believe, will be doing a tutorial for us, on my blog, sometime in April! So keep watch! My girls might draw blood fighting over this sample! LOL! Day two of Sneak peeks at Clear Dollar Stamps! What is Charliene doing this month, you ask? She is trying to keep dry under her cute little umbrella! Charliene April Showers is our newest in our Charlie line of stamps for the month of April! Isn't she adorable! One more little mini card to give my girls....they just love getting samples as gifts! This sample was designed by Candy.....what a cute gift to give someone! Cat-tastic is just fantastic, isn't it! So cute! This sample set was designed by Candy! FABULOUSLY CUTE! Where can you see more samples? Day one of Sneak Peeks at Clear Dollar Stamps! Are you ready to ride? The first set we are going to show you today is Dirt Rides. We have had a lot of requests for this set, and we are proud to make it available April 1st....no foolin! This card is very easy to make! The image was colored with copic markers. I then took my Versamarker (which is the same ink as the embossing pad but in a pen) and colored a puddle below the four wheeler and then colored mud spots on the four wheeler. Sprinkled with brown embossing powder and heat embossed.....ta-da! Mud! The below page was designed by Candy Fosta. My girls have a lime green four wheeler with a lime green seat accented with pink polka dots that will look smashing on this page! Horse Poetry, is sure to win your hearts! We know we have a ton of horse fans, so we thought this would be an excellent addition to your collection! Now that the picture is taken, I think I'll go eat one of those snickers! Here's where you can go to see more samples! See you tomorrow for more sneak peeks....available to purchase on April 1st! April Guest Designer Challenge Call! I am SO sorry to have to end entries before the official end of the day, but we need to have time to vote before we pick a final entrant tomorrow morning! I will make sure to mention the time of day for next month's Guest Designer Challenge! APRIL 2009 GUEST DESIGNER CHALLENGE!!!! Use the color purple on your card or project. Use as much purple as you want, or as little as you want, the point is to show us your creativity with this color. There are many things that can be purple... flowers, birds, clothing, fruit, other plants, toys, bugs, furniture, appliances... get creative and show us some PURPLE. include a LINK directly to your entry (If you upload to SCS, include this KEYWORD: CDSGDC0409) Please make your link directly to your post and not just your general blog. U.S, due to shipping times. A sneaky preview of the previews! All their links are in my left sidebar! Here are a couple of peeks now! This sample is made from our new Dirt Rides set! We have had many requests for male stamp sets....we think this one qualifies! This sample is from our set Horse Poetry.....I know we have a bunch of horse fans out there! That's all for today, but don't forget to check back over the next four days to see what we have cooking! ***ETA*** Down below in the direction area, I had originally written that the posts should be 3" x 5/8", BUT, they should be 3" x 3/8". Thanks T. Philips for figuring it out! Good morning Clear Dollar Fans new and old alike! Its Katie again which also means that its Tuesday and I get another opportunity to showcase something fun, at least I hope you think so :) Well as you know... Easter is really just around the corner (April 12th) and guess what? I am prepared and ready to go - Yahoo! I am not a huge holiday "stuff" person, but I do like to have a little something special for the kids. I was browsing Easter Baskets and came across this really cute picket fence planter and wanted to recreate it for my boys. I decided to stick with a basic white for my picket fence basket. Once you've cut your acetate, you will need to score each side at 2 1/2"
The wonderful aspect about this acetate is that its very sturdy, but still pliable. After I score my lines, I gather the acetate and pinch it together towards the center to get my crease started. I then use my fingers to finish up folding the crease and get it nice and crisp with the bone folder. After I've folded all four sides, its just a matter of cutting so I can fold up my box. Cut only on 2 opposite sides. The picture below shows how the box will fold up with the cut flaps. Now, in the picture below, I went and used Scor-tape to adhere my 2 side flaps together because it allows me more control versus using just a tape runner. After the flaps are glued then I also apply adhesive to the 3 edges of the flap that will finish my clear box. Now your box is assembled so put that aside for now and we'll get ready to create our fence posts. For those you will need to cut a piece of cardstock that measures 3" by either 12" or 8 1/2", whatever size you will be using. You want all your fence posts to measure 3/8" thick so their end measurement will be 3" x 3/8" and you will need 28 total. I found that my Fiskars cutter worked best for this task and that I could cut easier moving my cardstock to the right by measuring to the right. That is the biggest feature that I like about this cutter are those extra right measurements. I've pictured my cardstock at the exact 5/8 measurement. Creating the picket fence post is super easy. Its just a matter of snipping 2 corners away. All you have to do is get one that you like and use that as your guide. I placed my "guide" on top of 2 or 3 pieces of cardstock and cut away! Before you can start attaching your fence posts though, I created 2 slats by cutting 8 pieces that measure 3 1/2" x 1/2" I placed one flush to the top of my box and the bottom one was attached about an 1/8" above the bottom. Yay! Now its time for the fence posts. This was really quite fun and went pretty quickly. I began by attaching posts on each end (of one side), then placed the middle one - just eye ball it here. Next, you'll fill in each of the divided sections. Each side will have a total of 7 posts. Again, just eye ball it here. You can always put your post down, just don't push too hard and you can adjust it as you go. When all the sides are done, you get to attach the handle. I used a small white brad for mine, but the possibilities are endless. As I'm typing, I was just thinking that a really cute flower at the base of the handle would be uber cute. Remember that 2 sides will only have 1 layer and the other 2 sides will actually be made up of 3 layers. Keep this in mind when you are using a hole punch. So now, I wanted to share a super cute way to fill your Easter basket. What about some SUPER CUTE Easter Bunny Nuggets. Oh my, I love these little critters. So what you need to make it even easier are some sort of address labels and of course this stamp set called Bunny Nuggets. Look at these very cute bunny faces. Again, the options are limitless and for those of you out there who are afraid of cutting out stamped images - fear not! These are quite easy to cut out and are just too cute not too. I attached the faces to the nuggets with glue dots. And finally, I wanted the boys to have a chocolate bunny of course, but I didn't want to get them big huge ones. This size was perfect, but sadly he was all covered up so I just "had" to expose all his chocolatey goodness in a super cute box! The carrot is a single stamp that can be purchased at Clear Dollar (link up above) and that little tag was created using a stamp from the Bunny Nugget Stamp Set (link up above). And one last time... a picture of the whole picket fence basket. Well, that's it for me. If you have any questions about anything you see here, make sure to ask! Thanks for spending you time with me and Clear Dollar Stamps and yay, there is plenty of time to make all the little Easter Baskets you need before Easter! Think about making these in a scaled down version for table favors - those would be the cutest! This is Katie signing off for Clearly iStamp. Have a great Tuesday!